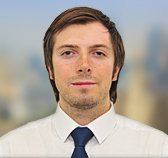 Date of issue: 17.10.14 Узнать о наличии версии 2015 года! The research contains 42 schedules, 23 diagrams, 21 tables. 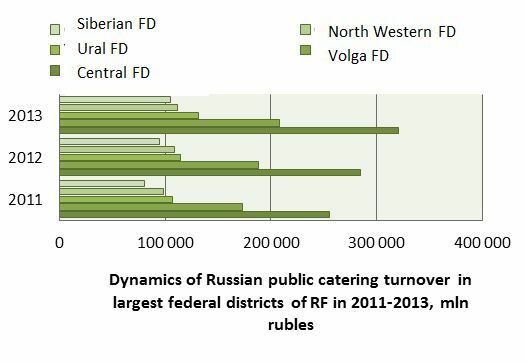 The largest federal district by the public catering turnover is Central FD. In 2013 the volume of services of this branch amounted to ***,1 billion rubles, Moscow accounted for **% out of them. Volga FD ranked second (**,3 billion rubles), Ural FD – third (***,2 billion rubles). The greatest relative growth of the parameter in 2013 was marked in North Caucasian federal district (**% compared to 2011) that speaks about fast rates of the market development in regions of this district, in particular in Republic of Dagestan. 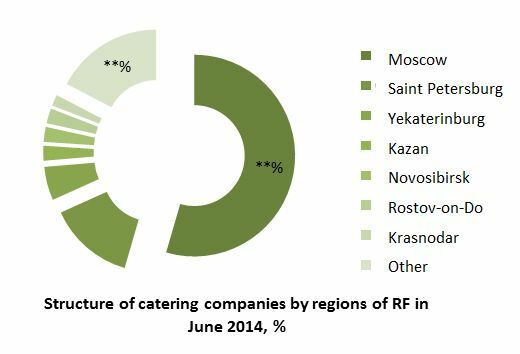 The share of Moscow in regional public catering market turnover structure in 2013 amounted to **%. During the surveyed period of (2009-2013) parameters decreased by 2%. Significant changes since 2009 were marked in Tyumen Region (the decrease by * %) and Republic of Dagestan (growth by * %). An increase of the aggregate share of Krasnodar Territory by * % (to **%) was caused by the expansion of the service sphere during the preparation to the Olympics of 2014. 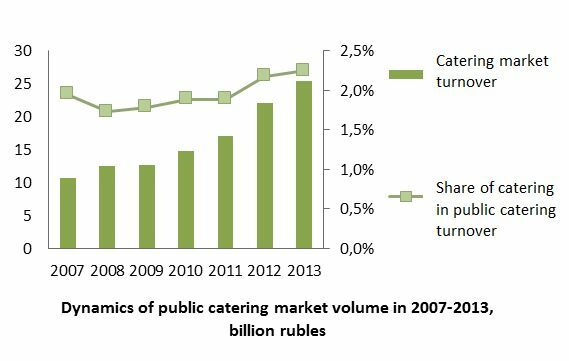 Geography of catering market of the Russian Federation is rather wide, where number of regions with enterprises in the declared segment of public catering market function, include: Moscow and Saint Petersburg. 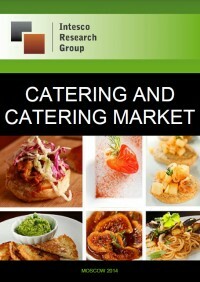 Distribution is influenced, certainly, by number of consumers, as at present, and possible in the long term. That is also important, how often large cultural, sporting or political events demanding a large number of the service personnel and individually developed holding plan takes place in the city. 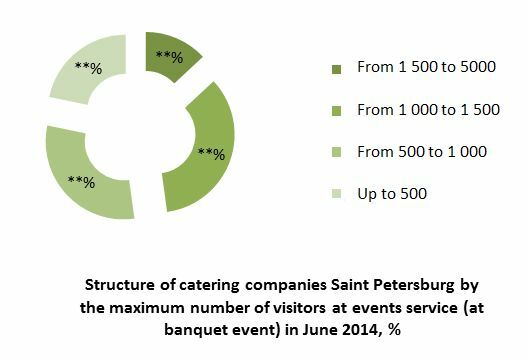 Characterizing catering industry of Saint Petersburg which has developed by June, 2014, it should be marked that those companies which form 90% of the offer, are engaged in event catering. The popular direction in the city and region is organization of banquets and buffet receptions on the territory of farmstead and palace complexes, with immersion in the old times atmosphere, with providing the menu made in style of traditional Russian cuisine. Specific weight of the companies organizing as corporate food at offices, and transport, makes **% (at each type of service). 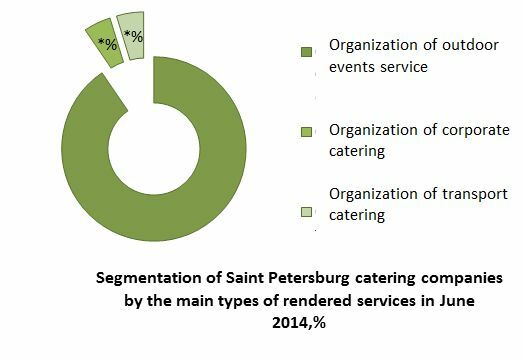 Peculiarity of the Petersburg market is that any of the presented companies is not accredited according to the specialized program: "CATERING PROFESSIONAL". One third of organizations belonged to banquet service format type which could serve number of guests ranging from 500 to 1 thousand. More than one fifth of the offer (**%) is the share of companies working for smaller target audience (up to 500 persons). Table 11. Dynamics of restaurats, cantees and bars proceeds (besides taxes, excises etc.) in Moscow in 2009-2013, mln rubles.